As The New York Times pointed out earlier this year, building Tower Fifth will involve a lengthy process due to its proximity to five landmarked buildings, including Rockefeller Center and St. Patrick’s Cathedral. Alongside permission from the Landmarks Preservation Commission, Macklowe will also need to go through the city’s ULURP process to transfer air rights from St. Patrick’s. Since Tower Fifth is planned to be 66 percent larger than current zoning allows, Macklowe will require special permits, zoning approvals, and zoning changes to push the process forward. If approved, Tower Fifth would become Manhattan’s 18th supertall—a tower taller than 980 feet—that has been constructed since 2008. As 6sqft previously reported, Macklowe Properties has tapped Gensler with Adamson Associates Architects for the design. The facade will be wrapped in a Closed Cavity system capable of reducing solar heat gain by more than 70 percent—the first of its kind in North America. 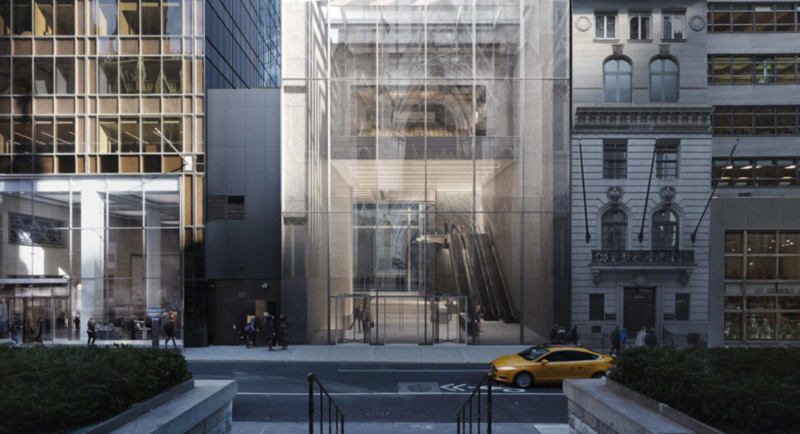 The building would feature an 85-foot-high glass lobby framing St. Patrick’s Cathedral. Above the lobby, there would be shops, a food hall, and a public auditorium made of glass, overlooking the landmark. Tenant space would measure 960,000 square feet throughout the office floors, according to the architects. Amenities will include a lap pool, yoga room, and a multi-level running track. Once complete, the building will also boast the city’s tallest observatory, from which apparently visitors will be able to descend via a 60-foot transparent corkscrew slide.